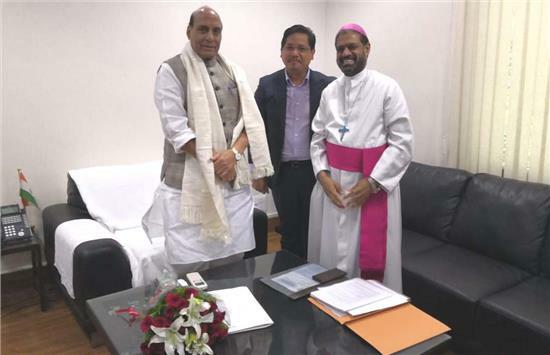 The Secretary General of the Catholic Bishops’ Conference of India, Bishop Theodore Mascarenhas, along with Mr. Conrad Sangma, Chief Minister of Meghalaya, called upon Shri Rajnath Singh, Union Home Minister at the residence of the Minister on 3 September, 2018. Bishop Theodore briefed the Home Minister about the various difficulties that the Christian Communities and Organisations were facing in different areas like the FCRA and other organisational matters. He placed before the Home Minister in a special way the difficult situation through which Christians were going through in Jharkhand where the Christian NGO’s are feeling selectively targeted by the authorities specially through an investigation in the FCRA accounts of 88 NGOs all of which are Christian. The Bishop told the Home Minister that the we were very troubled that investigations were launched into the accounts of these NGOs by Anti Terrorist Squads, the State CID Department and the Income Tax Authorities. Sometimes just 6 or 12 hours were given to present the accounts. He also briefed him about the difficulties faced by the Missionaries of Charity. Mr. Conrad Sangma, also spoke very strongly on the need to attend to the fears and apprehensions of the Christian Community. He described to the Home Minister, the dedicated services of the Mother Teresa Sisters and other Missionaries. He also pointed out that the Sisters and Missionaries sacrifice everything to serve the poor and the marginalised. Mr. Sangma told the Home minister that it was shocking that the Anti terrorist squads were deployed to investigate the missionaries. Shri Rajnath Singh gave a very patient hearing and assured all help. He said the Christian Community was a peace loving community and he want the Christians to continue their work undisturbed and freely. He spoke of his very beautiful experiences of the Christian Missionaries. The Secretary General thanked the Home Minister and wished him and his family all God’s blessings on Janmashtami, the Birthday of Lord Krishna.